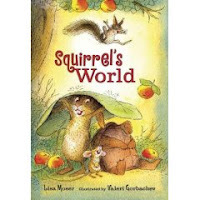 Squirrel's World by Lisa Moser, illustrated by Valeri Gorbachev. Grades 1-3. Squirrel, an adorably ADD woodland creature, only wants to help his friends. The problem is he always seems to be trying a little too hard. The episodic chapters in this beginning reader book detail Squirrel's interactions with Mouse, Turtle, and Rabbit. He collects food with Mouse, plays a game with Turtle, and helps Rabbit get a lily pad from the pond, each with varying degrees of success. In the end, though, all Squirrel's friends realize that his heart's in the right place. All he wants to do is help and his gestures turn out larger than life. By the end of the book, he's even helping his friends go to sleep. Valeri Gorbachev (illustrator of All for Pie, Pie for All and The Giant Hug, among others) adds perfectly cheery illustrations. They're cute without being cutesy. Hand this one to fans of Frog & Toad or anyone looking for a super cute first chapter book. I'm hoping we'll see more of Squirrel and his friends.